Now let’s take a look at some of the Division 1 wrestlers that we need to keep an eye on during the 2018-2019 season. This list is by no means comprehensive! Heck, I can almost guarantee that there are a few wrestlers who I don’t even mention who will go on to win a S9 title and perhaps even place in NYS! And that’s a great thing…it just shows the quality and depth that we have in Section 9 wrestling! This is going to be a great season!!! Vespa is without question the most decorated wrestler in Section 9. He is already a 5X S9 placewinner, a 4X S9 finalist, a 3X S9 champion, and a 2X NYS placewinner. Marco came in 4th in the state at 113 as a sophomore and 3rd in the state at 120 as a junior last season! Make no mistake about it, Vespa has laser focus on becoming a NYS champion in Albany this coming February! Leonard opened some eyes in 2017 when he finished 3rd in S9 at 182 as a sophomore. In 2018 things really started to click for him. Will finished with a 39-6 record including a 4th place finish at the Eastern States and a 6th place finish in Albany at the state tournament! DeCapua burst onto the scene in 2016 as an 8th grader placing 3rd in S9 at 170! He did not place in 2017 but came in 3rd at 195 last season and earned a wildcard to the state tournament where he finished in 6th place! Maxx loves to throw and is a very dangerous match-up for any opponent! 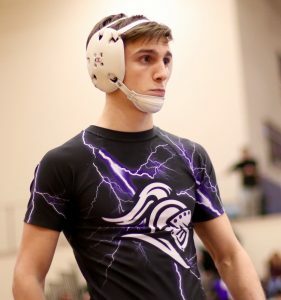 The NFA senior was a S9 finalist as a sophomore (lost to Barczak) and last year as a junior he claimed the title at 152 pounds defeating at large entry Joe Pushman. Serafini went 1-2 in Albany and is looking to make the medal stand this year! Romano scored a late against MV’s Sean Savacool to notch his first S9 title. The VC junior wrestled well in Albany going 1-2 including a close 4-2 loss to state finalist Justin McDougald. We can expect another very good season from Romano! Morales gutted out a few very tough wins in the S9 tournament. He scored late takedowns against MV’s Andrew Filip in the semis and Cornwall’s Christian Prokosch in the finals to win the title at 99 pounds. Santander had a great S9 tournament! He pinned NFA’s Maxx DeCapua in the semis and then won a close 3-1 decision over MV’s Anton Juncaj in the finals. He earned the second seed at 195 in the state tournament but unfortunately went 0-2. A Few Others To Keep An Eye On…. Suarez is a 2X Section 9 finalist who is laser focused on earning his first trip to the state tournament. The very talented MV junior came in 2nd at 99 pounds as a freshman, and last year he lost a 7-3 decision in the finals to Dylan Earl who finished 5th in NYS at 113! This could be Jordan’s year! Askey is one of the hardest workers in Section 9! He placed 2nd at 126 last year after losing in the finals to 3X S9 champ Connor Greiner and came in 4th in the sections in 2017 at 120. After taking 3rd at 120 in 2017 McGinty made it to the finals at 138 season before falling to 3X S9 champ Dom Vetrano this past season. McGinty is very tough! Could 2019 be his year? The Minisink Valley junior lost 6-4 in the Section 9 finals this past season to Greg Fischer who finished 6th in NYS. He also came in third at 99 two seasons ago as a freshman. Savacool lost to VC’s Matthew Romano in the Section 9 finals at 126 this past season. He had a 33-8 record and notched a few big wins for the Warriors. He’s a grinder and will be looking to make his first trip to Albany this coming season. Nick finished 4th as a sophomore at 126 and was a Section 9 finalist last season at 145 where he lost to teammate and 2X S9 champ Vinny Vetrano. Albornoz gets better every year and will definitely be in the hunt this season! The D1 football prospect opened quite a few eyes last season when he made it all the way to the S9 finals at 195 before losing a close 3-1 match to Santander from MW. Anton has a lot of upside and could have a huge season in 2018-2019! Crisfield made it to the finals in a very competitive 220 pound weight class in which the top 4 wrestlers all return – Leonard, Crisfield, Fenner and Owen. This will be fun to watch again! The Crusader heavyweight was a S9 finalist last season dropping an extremely exciting 3-2 decision in the finals to Fenner from MV. Havison is a very tough match-up for any big man and will definitely be in the hunt for a trip to Albany this season! And Let’s Not Forget About…. Amell was the 99 pound Section 9 champ in 2017 but missed all of last season due to injury. He will definitely be one of the lightweight favorites this season! Faison was the top seed at 132 last season but was injured during the semis of the Section 9 tournament and had to forfeit to 6th place. He’s very talented and even notched a 10-5 win over S9 champ Romano last year! The list could go on and on, but Steve Gazillo (Cornwall) and Nick Florin (Pine Bush) are tough as well! Both will do well this season! I completely agree…several others too including Bucci, Fenner, and Owen!